(NaturalNews) If you live in the USA, you're probably experiencing some of the effects of a cold weather front and multi-state blizzard that's sweeping across much of North America. While the weather felt like summer just a few days ago, suddenly much of the upper Midwest is blanketed in snow and reeling from freezing temperatures. On the final two days of April, Amarillo, Texas saw temperatures rise well into the 90s. A record high temperature of 97 degrees was set on April 30. A little more than 24 hours later on the evening of May 1, temperatures in this Texas Panhandle city plummeted into the 30s before bottoming out at 33 degrees on the morning of May 2. The wind chill at the time was 19 degrees. A rare and historic May snowstorm continues to pelt Iowa, Minnesota, and Wisconsin with snowfall amounts unprecedented in the historical record for the month of May. Rochester, Minnesota has received 7" of snow, smashing their all-time May snowstorm record of 2", set on May 4 - 5, 1944. Over 3" of snow has fallen in Omaha, Nebraska, breaking their all-time May snowstorm record of 2" on May 9, 1945. It was the first one-inch-plus May snowfall anywhere in the state of Iowa since 1967. Topeka, Kansas, Kansas City, Missouri, and Des Moines, Iowa are all expected to get an inch or more of snow on Thursday through Friday. This would be only the second May snowstorm in recorded history for those cities. But wait a sec, isn't it May? Isn't this supposed to be spring? Welcome to the weird world of weather radicalization. We're all watching it unfold right before our very eyes: extreme droughts, 500-year floods, fires and blizzards are all getting worse than anyone can remember. It's not just that we have more technology to detect and report on these storms today; the storms are actually getting worse and more frequent. • Global warming and carbon dioxide emissions, all pointing to the need for global government to limit human activities in order to save the planet. • HAARP weather control experiments being run by the government to destroy the global food supply and hijack power during the crisis. • Solar weather effects having a greater impact on the planet due to the weakening magnetic fields that may also point to a "magnetic flip" in the near future. • Chemtrails being sprayed into the atmosphere to alter global weather patterns. • Weather weapons being deployed by enemy nations as a form of economic warfare. Frankly, I'm not sure what theory to believe in all this. Weather is extremely complex, and nailing down the causes for observed weather events is exceedingly difficult. But we can't argue with the outcomes we're observing: the weather is becoming more radical (and therefore less reliable) than we've ever seen in recorded history. 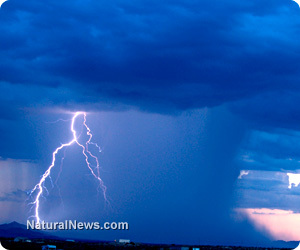 Radical weather patterns cause food production to plummet. Simply put, when nature deviates from its normal cycles, it throws food production into chaos. A one-night drop below freezing, for example, can wipe out the entire citrus crop in Florida. A Midwest drought recently collapsed corn production there, and almost two years ago, a severe drought in Texas caused a collapse in grazing grasses, resulting in a mass slaughter of starving cows that could no longer be fed. The upshot of that was plummeting beef prices, followed by a spike the next year as herds had been thinned out far beyond normal. The "latency" between the radical weather and resulting food prices is anywhere from one month (for fresh produce) to a full year (for processed, manufactured foods). This means that crazy weather patterns today might not spike food prices until next year, depending on the crops in question. Because the weather is becoming more radical, food prices are trending sharply higher. The USDA, which downplays food inflation for political reasons, admits that food prices rose 3.7% in 2011, 2.6% in 2012 and are currently rising at 3% in 2013. These numbers are artificially low, of course, as is readily evident at the grocery store right now. But even when kept low, they still portray an alarming scenario when you consider these food price increases are compounded annually. That means they pile on top of previous year's increases, causing the resulting price spikes to rise faster than might be expected by intuition alone. For example, if food prices increase at just 3.5% per year, they will double every 20 years. But the actual food inflation we seem to be experiencing when you consider the real products that people buy is closer to 6%. And at 6%, food prices double every 12 years! For food prices to drop, food production inputs must fall in price at the same time weather patterns become more predictable. This is extremely unlikely to occur any time in the foreseeable future, especially with fresh water, topsoil and fuel all becoming increasingly scarce and therefore more expensive. For those who don't know, farming is extremely resource intensive, using enormous quantities of water and fossil fuels to produce food. For example, it takes 1,000 liters of water to make 1 liter of milk. Similarly, it takes 15,400 liters of water to produce just 1kg of beef. This report shows that the "water footprint" of a typical U.S. citizen is a remarkable 2,842 cubic meters per year. That's three quarters of a million gallons of water PER PERSON, per year. Once you understand this relationship, you'll understand why rainfall and weather patterns are so crucial to the food supply. Just one inch of rainfall on just one acre of land delivers 6.2 million cubic inches of water to the land (and whatever is growing there). That's 27,000 gallons of water per acre with just a one-inch rain. In a drought, large pieces of land are subjected to huge water deficits running in the billions of gallons. Under such conditions, edible plants simply cannot grow, and even grazing animals like cows are unable to even maintain current weight. This also explains why weather control can be such a powerful weapon. By controlling the weather or influencing the intensity and duration of rainfall, enormous impacts can be set in motion for the entire nation. And weather control, of course, is a reality in 2013. Scientists in Abu Dhabi are already using weather control technology to increase rainfall in that desert city, for example. This doesn't mean, of course, that every weather artifact is a result of human manipulation. Here, I'm just pointing out the incredible power of weather modification to alter the outcomes of entire nations. To think that world governments would ignore this opportunity for covert economic and environmental warfare is naive. The net result of all this is that food will continue to become more expensive with each passing month. Interestingly, this simultaneously makes home food production technologies more economical. Aquaponics, for example, is an amazing food production technology that grows food for a fraction of the cost you pay at the grocery store. Although initial startup costs may seen high, they can often be earned back in two years or less through home food production. If you're interested in aquaponics, the book I recommend is called Aquaponic Gardening: A Step-By-Step Guide to Raising Vegetables and Fish Together by Sylvia Bernstein. Sooner or later, people who want to economically survive the coming era of financial turmoil will need to learn how to grow a significant portion of their own food. Aquaponics is the best technology that exists today to accomplish that. It grows fish protein, plant medicine, fruits, potatoes, vegetables, spices and much more.